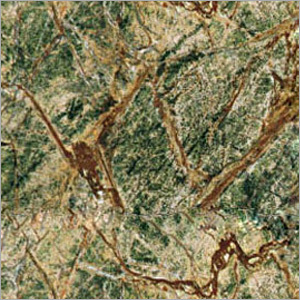 Also referred as reinforest green marble, the Bidassar Green Marble is notable for its mesmerizing appearance. The surface of this marble is noteworthy for clearly visible veins of contrasting color. Variation in its vein pattern is one of its main attributes. Known for its high hardness level, this specific marble is appreciated for is uniform texture and superior finishing that has contributed to its elegant look. It is widely used to design and decorate tabletop, floor, wall for bathroom and wall covering for its moisture withstanding capacity and hassle free maintenance technique. With having a team of efficient members, we have emerged as a successful exporter and supplier of premium quality Bidassar Green Marble. This marble is accessible with sawn or polished surface finishing.